Anyone who follows college football knows about the NCAA’s decision to create a national college football playoff. 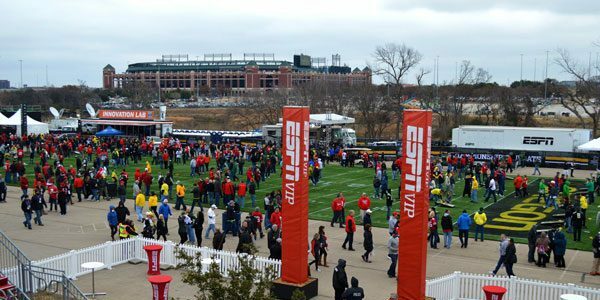 That first playoff happened at AT&T Stadium, in Arlington, TX in 2015. In this historic event, Ohio State defeated Oregon in the inaugural College Football Playoff National Championship. There were more players at this event than the ones on the field, however. The ETZEL Agency was in full force, one of the most recognized sports marketing firms in the world. The City of Arlington staff were everywhere making sure that attendees were safe and having a good time. 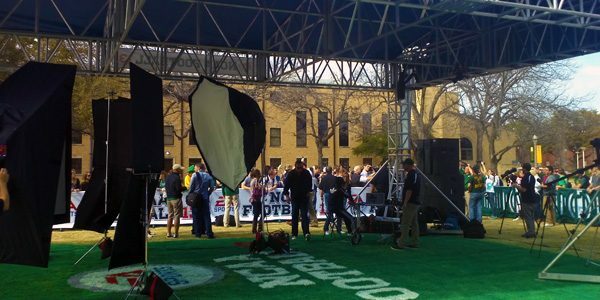 And, of course, our staff were there providing sporting event production services for the very first NCAA Championship Tailgate Party! For this show, our staff provided a list of live sporting event production services. 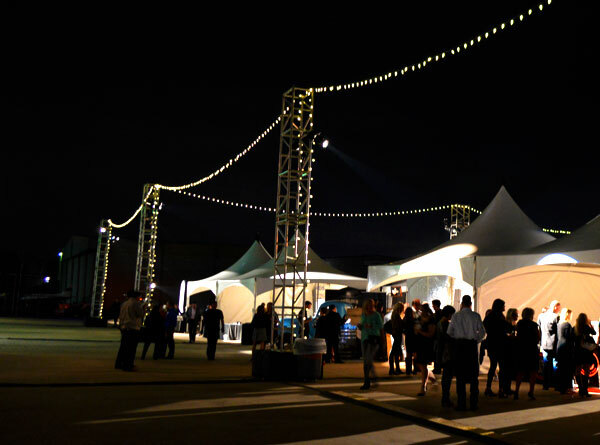 Attendees at both entrances were first greeted by our three-dimensional gateway towers, complete with lighting and custom signage. The Postano social media tower was a three-sided video wall that projected sponsor and event information. 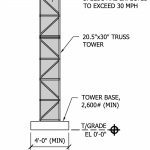 Our staff custom designed a 20 foot tall ballast and vertical truss structure for signage in twelve locations over the entire site. Our staff also provided a laundry list of staging and scaffolding structures, including a stage thrust, camera platforms and spot platforms for the main stage performance area. As always, our first priority is safety. 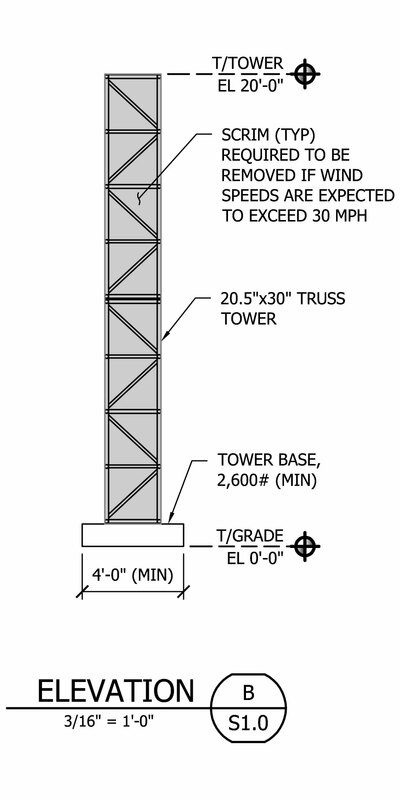 When the City of Arlington required each vendor to have individual permits for every structure, the staff promptly provided the engineer drawings needed. As a Certified Building Contractor with the City of Arlington, we were able to get the permits and inspections taken care of before most of the other vendors. And In Depth Events was the first vendor to receive green tags on inspection day! The day of the event was overcast and cold. 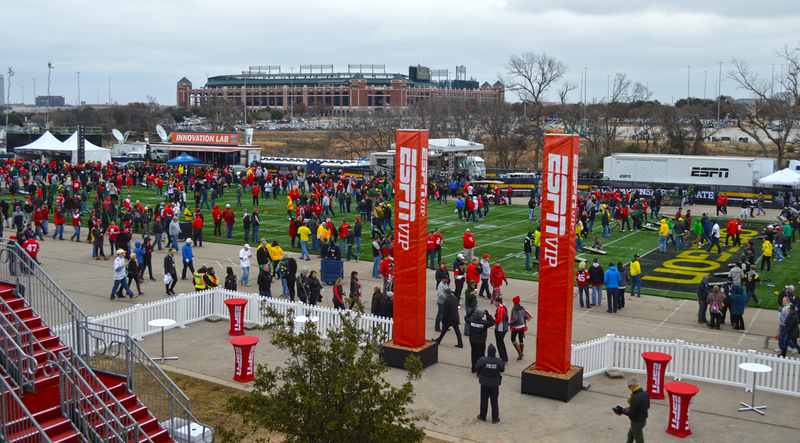 But that didn’t stop the fans from attending the inaugural Championship Tailgate party and, of course, the game itself! we were proud to be a part of NCAA history and we look forward to working with our new friends and colleagues at ETZEL in the future. 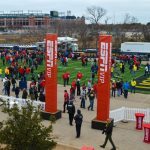 The staff at In Depth Events has a long history of providing live sporting event production services for sports marketing firms like ETZEL. You can see our page devoted to sports marketing firms here. 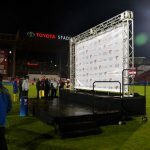 If you are interested in finding out how In Depth Events can provide production services for your sports marketing firm, then Ask a Question of our sports marketing events experts. We look forward to hearing from you and working with you! 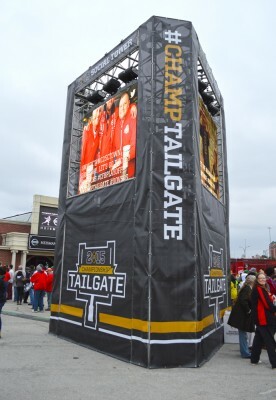 It’s an age old problem for marketers at concerts, festivals and sporting events – how do you actively engage the audience for your product or service from a 20 foot x 10 foot booth space? Your potential consumers are walking by your activation with strollers in front and children trailing along behind. 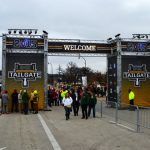 The last thing they want to hear is a sales pitch as they walk from the parking lot to the event – or even worse, from the event back to the parking lot. In this unfortunate environment, you reduce your street team to carnival barkers trying to get another dollar at the ‘pitch till you win’ tent. A new trend, however, is emerging from experiential experts and marketing firms which may come as a surprise to some. The new trend is to engage the client by giving them place to *gasp* sit down and enjoy the event! 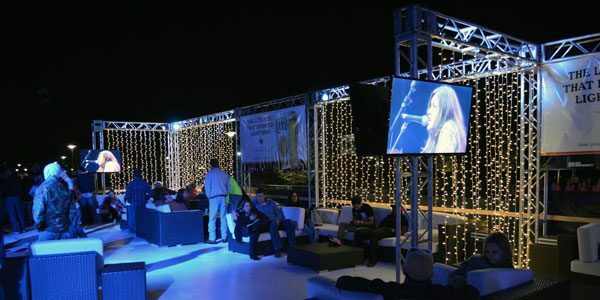 Instead of trying to steal their attention away from the event and on to your product, simply provide concert lounges or skyboxes that complement your brand along with the event they came to see. 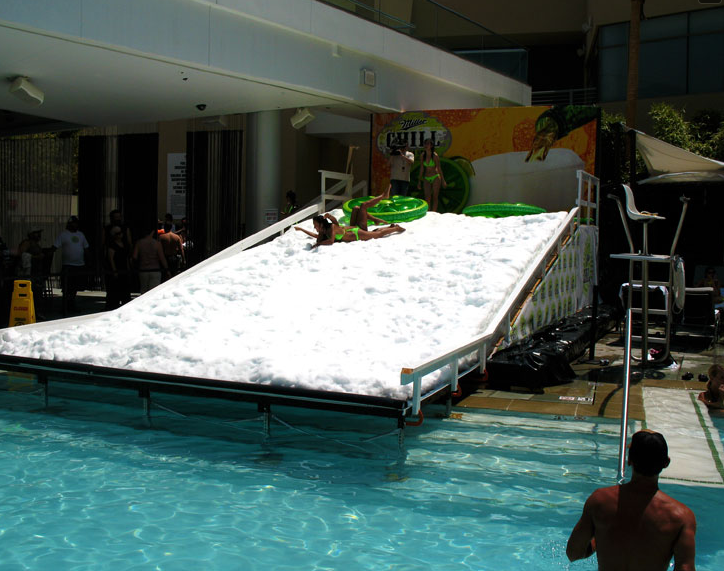 This radically simple idea is starting to take the live event marketing world by storm. And the production experts at In Depth Events are here to guide you to the right activation for your brand! Outdoor festivals are a lot of fun – for about 30 minutes. After you throw your blanket down, it’s only a matter of time before someone steps on your fingers, blocks your view or lights up next to your kids. (“Dad, what’s that smell?”) Wouldn’t it be nice to have a comfortable place to watch the show without… well, the rest of the attendees? 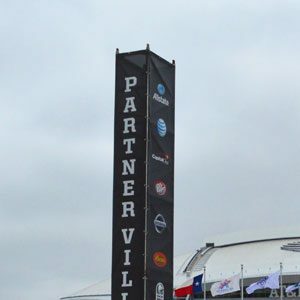 At SXSW 2014, the largest outdoor festival of its kind in the world, two beverage companies provided concert lounges. These activations were off-the-ground platforms with security personnel, comfortable seating and beverages; along with a live video feed of the event. Both lounges were general admission and provided outstanding views of the main stage at Butler Park. The first activation was by the energy drink, Monster. They served their namesake product along with non alcoholic soda and other beverages. With a ground level seating area and a covered platform, they were able to represent their brand to attendees without actively ‘pitching’ their product. 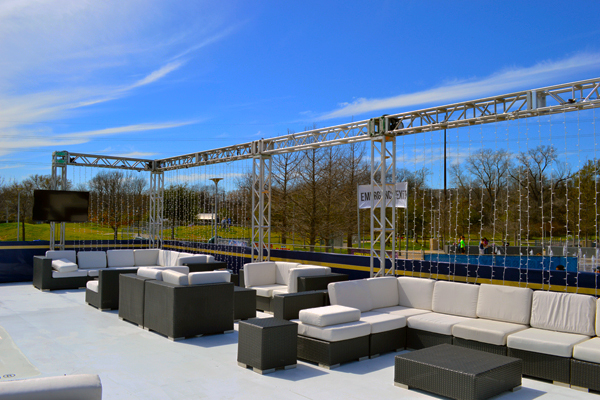 The second use of concert lounges by Miller Lite was built from the ground up by our production experts. 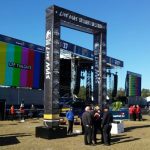 The activation footprint featured a commanding 100 foot x 40 foot raised platform where attendees could charge their mobile devices, relax on furniture and see the Main Stage show in real time on several video monitors. 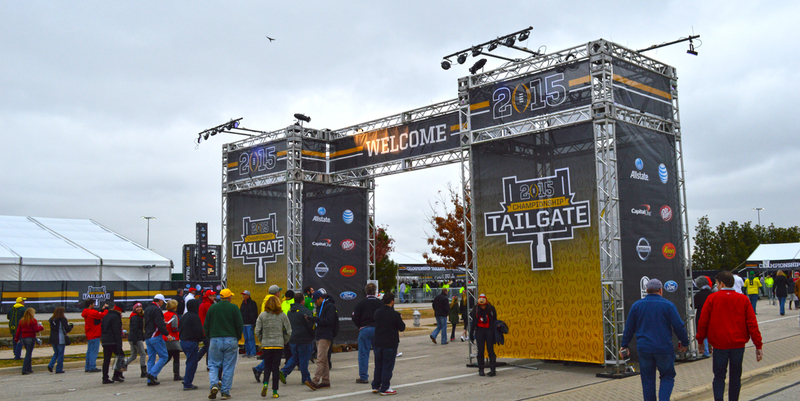 Of course, the bar served ice cold Miller Lite with graphics scattered around the activation to reinforce the brand. 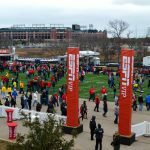 These activations showed that attendees could both enjoy the event they came to see and the marketing firm could promote their client’s brand in a complementary way. Most importantly, at both activations, attendees were charged for the beverages but not for entry to the concert lounges. In other words, the marketing firm was able to show sales figures as a direct link to impressions. 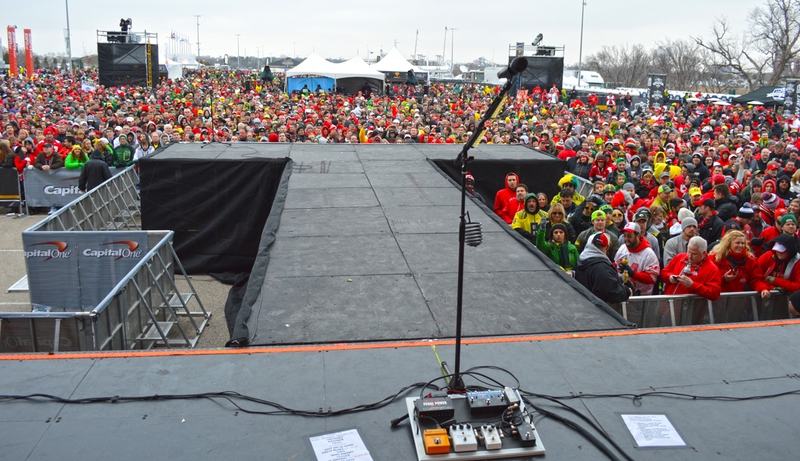 VIP Risers at concerts are not a new idea. However, providing a “Best Seat in the House” viewing platform takes an old idea and puts a new twist on it – plus the ability to market to a select group of consumers! 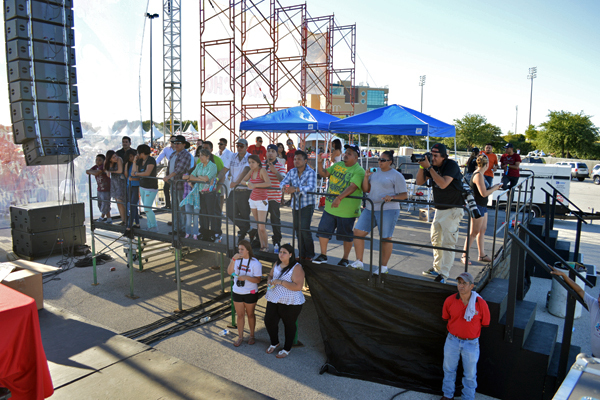 Pepsi has had a great deal of success with viewing platforms at Liberman Broadcasting concerts. 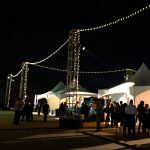 This hispanic-themed event garners 20,000 attendees in the Dallas market for both spring and fall concerts. 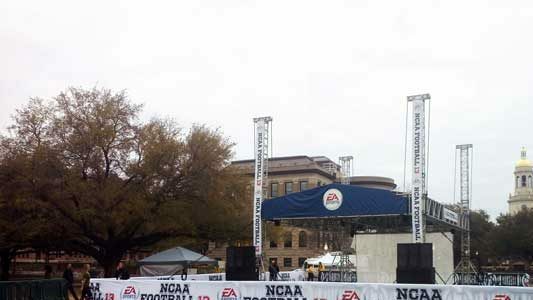 A 20 foot x 20 foot platform is erected off stage right, raised at the same level of the stage and covered with tents. Then, a select group of attendees are invited to the platform to watch their favorite bands. Of course, Pepsi brand ambassadors are there to give away plenty of ice cold beverages and CPGs to the lucky attendees. While this concept doesn’t work for general admission, it gives a few lucky attendees the ability to see the show from the “Best Seat in the House” and garners the Pepsi brand lifelong consumers. The platform and the marketing banners attached to it are easily viewable by the main audience, so not only do you get ‘eyes-on’ impressions in the audience, you also have the ability to interact with general audience members who might want to be on the platform during the next concert. 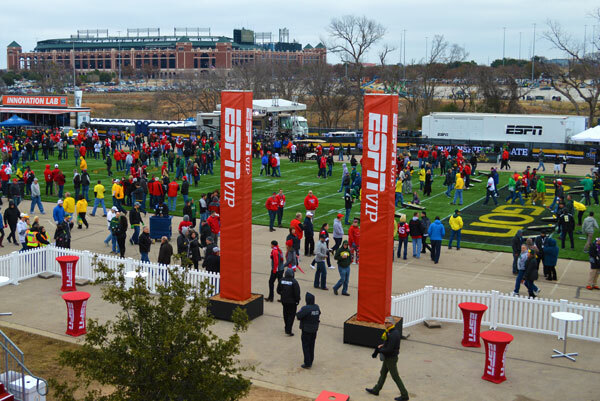 Skyboxes and VIP Lounges: Perfect for Outdoor Sporting Events or Indoor Trade Shows! Providing an elevated viewing platform is a great way to get your potential consumers around your branding and engage your specific product – while still being able to relax and enjoy the event. 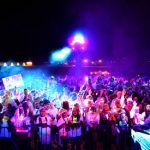 While this is not a new idea at events like golf tournaments (where the attendee demographic includes top income earners), the concept is making new inroads at other events. 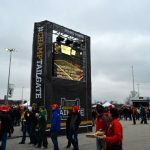 Automobile racing events, large corporate sponsored ‘tailgate parties’ for professional football, baseball and basketball events and even extreme events like the X-Games and motocross events are now seeing skyboxes sprout up around their events. What about a viewing platform at a trade show? 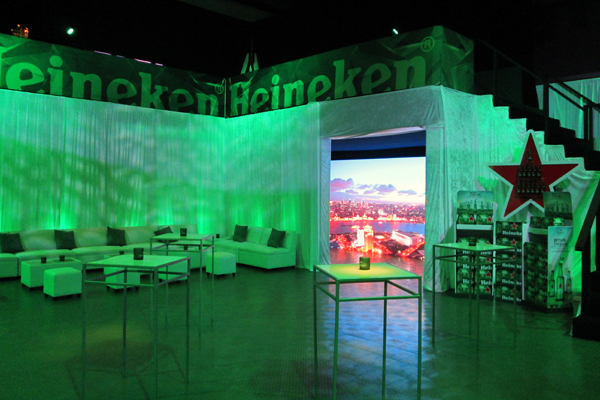 Heineken is the latest to provide an elevated viewing platform at a beer convention in Houston, TX. This commanding L-shaped viewing platform was 11 feet tall and was an amazing way for invited guests to view the trade show in style. 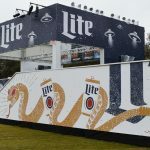 Of course, the structure was branded with Heineken graphics so attendees were able to see exactly which company provided the biggest and best presence at the show. Now, to find the best provider! Providing a potential consumer a way to relax and enjoy the event they came to see, while still being able to promote your brand, is a simple but revolutionary new concept. These new trends in experiential and live event marketing are already here. Your client will be utilizing these new types of activations to communicate with their consumers. Make sure to bring your clients the best solution for their specific needs – or they’ll find someone else to do it! 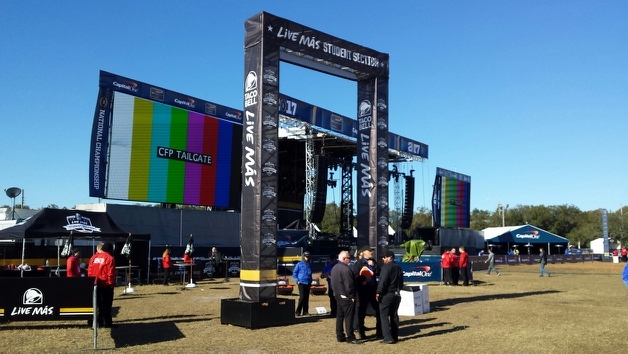 When providing concert lounges, VIP lounges, skyboxes or viewing platforms, it’s important to choose a production company that can work with your activation staff to provide the best experiential footprint for your clients. The professionals at In Depth Events are experts at providing structures for your next footprint, as well as the audio, lighting and video requirements to make sure your message is clear. Ask Us a Question today and find out how we can help you take advantage of these new trends!